Mist like a sea moves through the city: tall medieval spires pierce through the undulating grey cloud. Suspended by some unseen force, they float above the streets. In the whole world, there’s nothing quite like the medieval skyscrapers that rise along Princes Street Gardens, majestically welcoming visitors into Old Town. 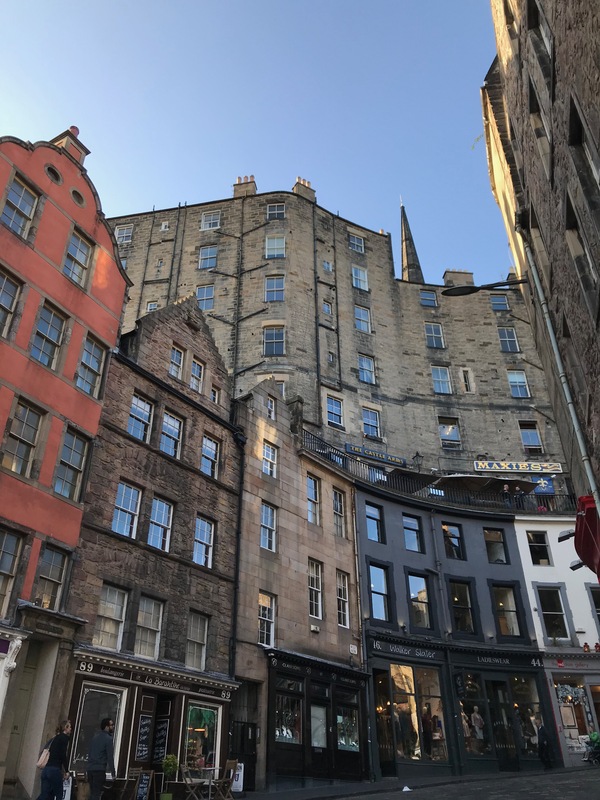 Upon entering Edinburgh’s Old Town, walking paths are alleys where you zig and zag through buildings stacked on top of one another. Eventually, you’ll stumble out into a wide square where gothic arches soar upward into heaven. Your eyes will continue up a wide boulevard to an enormous, boulder-like fortress. Burnt red brick melts into granite colored rocks the size of houses that cascade down the side of a mountain. The mountain is a volcano. 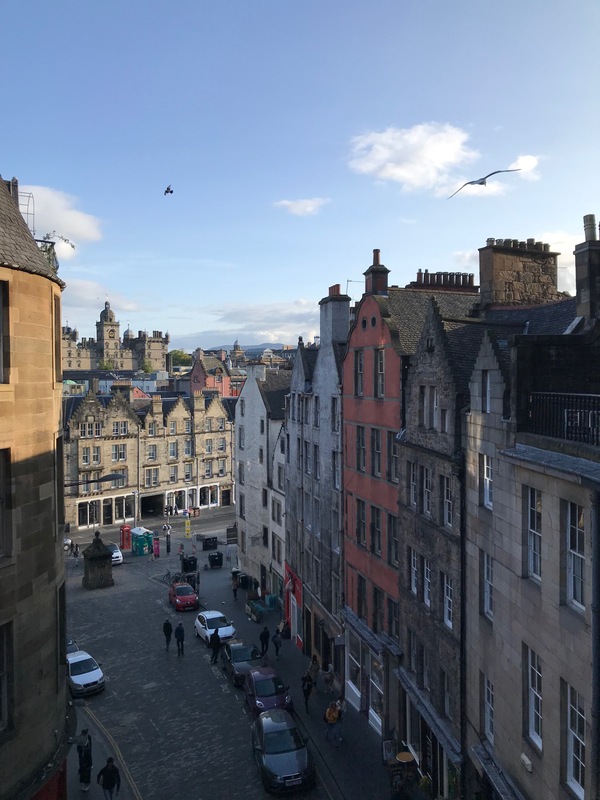 From her accommodating people and dumbfounding architecture to the mist that wafts through the cobbled streets, in Edinburgh, magic sizzles just under the surface. From King Arthur to Harry Potter, the magic of Edinburgh has inspired artists and authors for centuries. 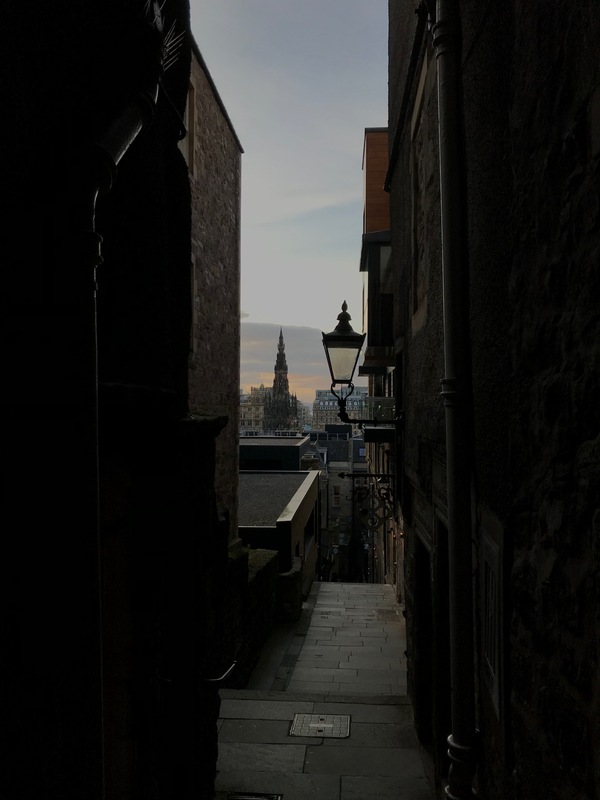 If you’re planning a trip to Scotland’s cultural capital, don’t be afraid to suspend your disbelief and get lost in the mystery. 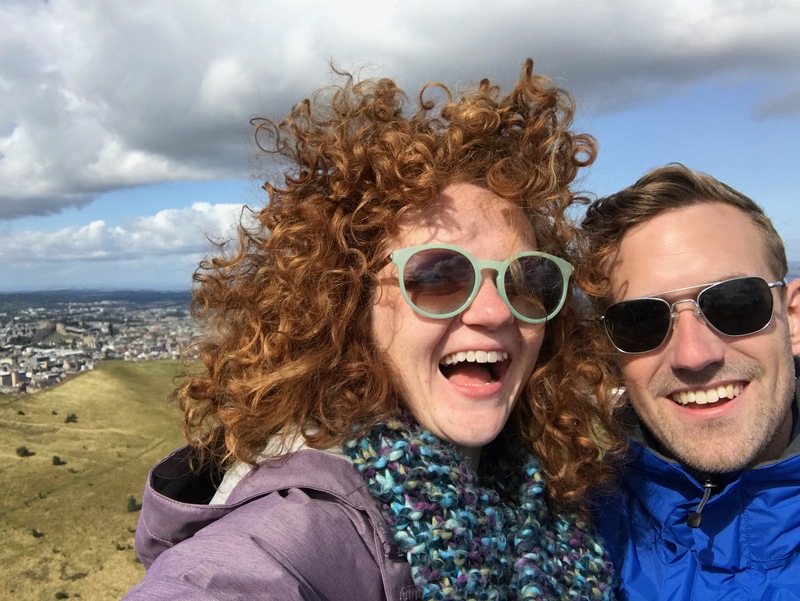 Kyle and I were in Edinburgh for four days and I’m anxious to go back because we left so much unexplored. 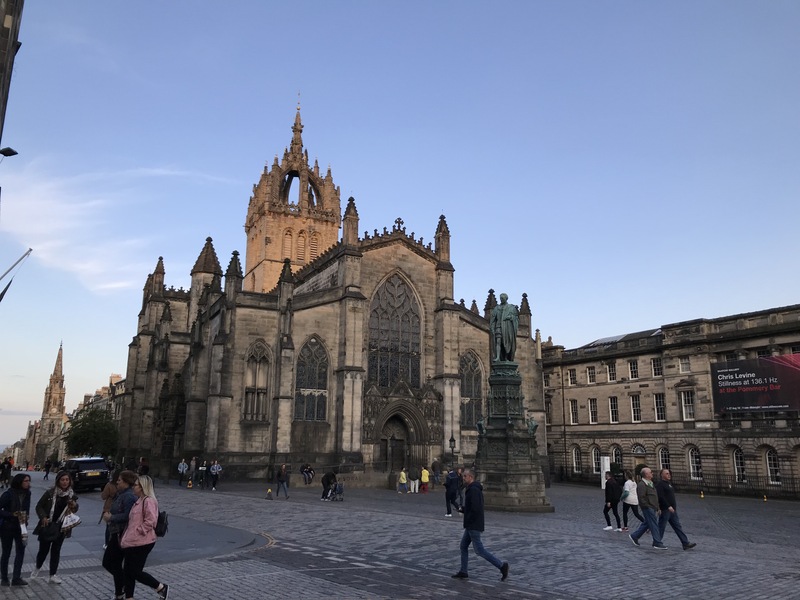 We visited at the very end of the Edinburgh International Festival, which coincides with the equally – if not more popular – Festival Fringe. During The Festivals in August, the city of around 600,000 residents hosts millions of visitors. While we arrived on the second-to-last day of the Festival, the crowds were manageable and all the people of Edinburgh we encountered were incredibly gracious, if not a wee frazzled. The city while the festival was raging was an entirely different city to the one we met the day after it ended. On the first night we arrived, we sought out a comedy venue in one of Edinburgh’s well known – recently opened – medieval vaults called The Caves. A comedian from Canada, Michelle Christine, was doing a set and while waiting in the queue we met a really lovely couple from England. When in Edinburgh, go to Fringe! You never know who you might meet and have drinks with in an underground cave after a live comedy performance. On the last night of the Festival, we saw the most magical fireworks display – set to the live music of the Edinburgh Chamber Orchestra – in Princes Street Gardens. The fireworks were staged on Edinburgh castle. Kyle and I bought tickets weeks ahead of time so we could sit on the ground in the park. We waited hours to get in and for the show to start, and it was absolutely worth it. While we camped out on a tablecloth from the AirBnB at the top of the hill, with our grocery store picnic, we people watched and chatted with the groups around us. Once darkness fell and the orchestra began playing Holst’s The Planets, the castle lit up as if it was on fire. Sparkling rockets shot into the air and released an explosion of gold that showered down like fairy dust convincing me that JK Rowling was inspired by this display when she wrote about the leprechauns at the Quidditch World Cup. When a fire waterfall cascaded down the side of the castle onto the rocks below, we giggled like children, completely in awe. It looked like liquid white-hot fire water: it was magic. Old Town – the oldest and most visited part of the city – is wonderful for walking and exploring without a set destination. Great opportunities will present themselves down every close and behind every façade. Edinburgh is a city built for walking, especially in Old Town, but it’s not for the faint of heart. 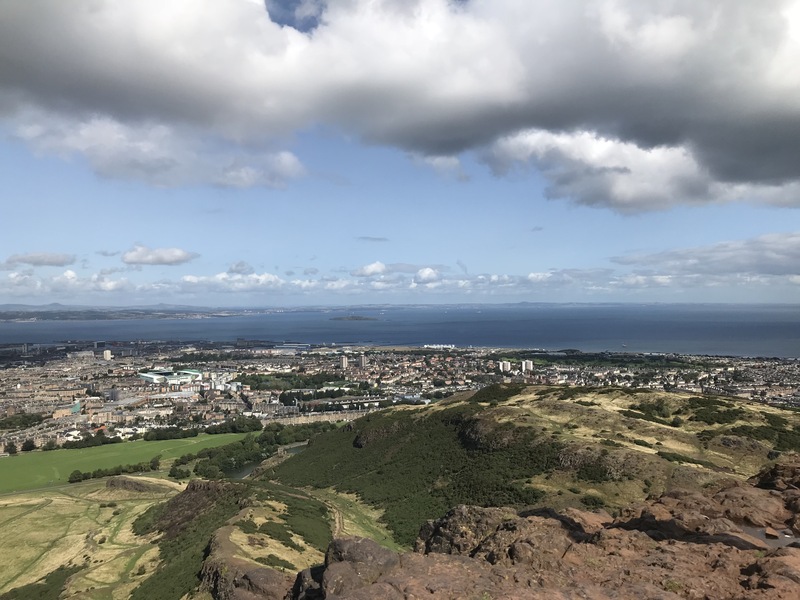 Scotland really loves her walks and Edinburgh is no different. With hundreds of stairs in any given day, Edinburgh’s Old Town isn’t the most accessible city for those who can’t or dislike to walk. Most of the streets are open to cars (except in August for the Festivals) and you can Uber or taxi when you need to, but bring your walking shoes. On the other hand, New Town – built by the organized Georgians in the 18th and 19th century – is much more open and while not flat, exactly, is certainly more accessible. 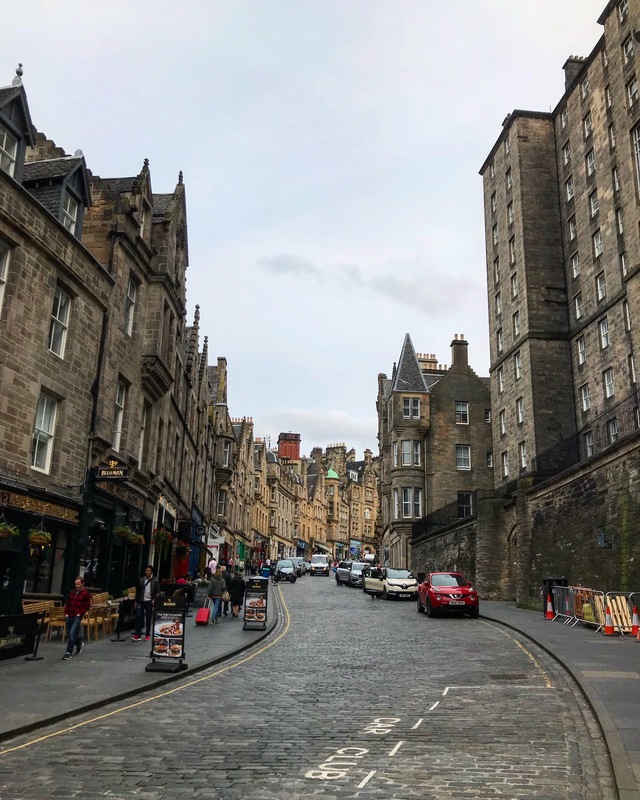 If you have the time, venture outside Old Town and get into some of the other neighborhoods around Edinburgh like New Town, Dean’s Village, and Stockbridge. Some of the best restaurants and shops are in these other parts of town and they make a great break from the endless march of tartan-clad gift shops on High Street. Kyle and I agree with what every single other visitor to Edinburgh told us: it’s cool and worth a visit because it is a medieval castle. However, it is not The Best castle experience. That can be found at Stirling Castle, about an hour outside Edinburgh by car. Edinburgh Castle is the most visited attraction in Scotland. The castle staff are a well-oiled machine of tourism, which makes the visit run smoothly, even though it’ll be packed whenever you go. Buy your tickets ahead of time, prepare to be outside a lot, and go on the free tour that’s offered every 15 minutes. There’s an enormous gun – not cannon – that a real military person fires at 1pm every day, so that’s exciting. Unfortunately, there is an exhausting amount of military history at Edinburgh castle. It all melted together in my mind but there were at least two entire buildings devoted to an excruciatingly detailed history of the entire British army and Scotland’s role in it. 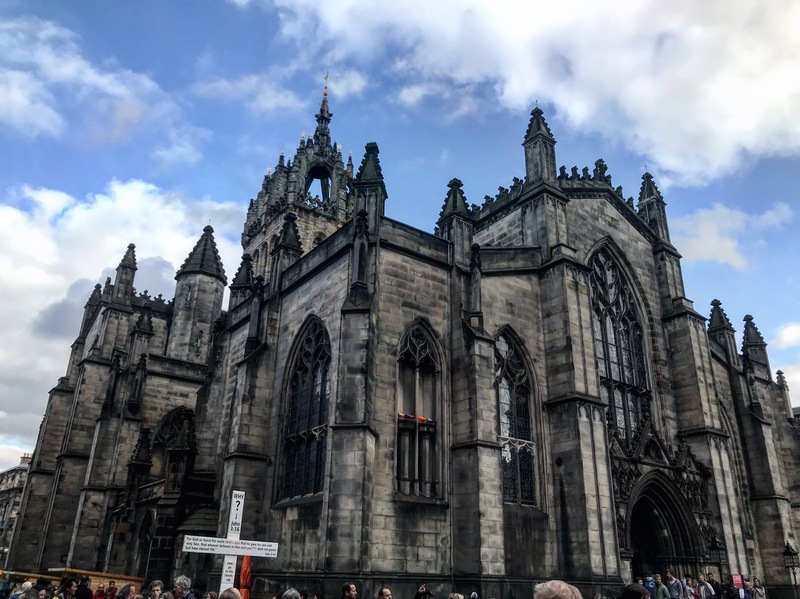 Two highlights are the Scottish National War Memorial honoring every Scottish soldier who died in war since World War One and the 12th century Saint Margaret’s Chapel. 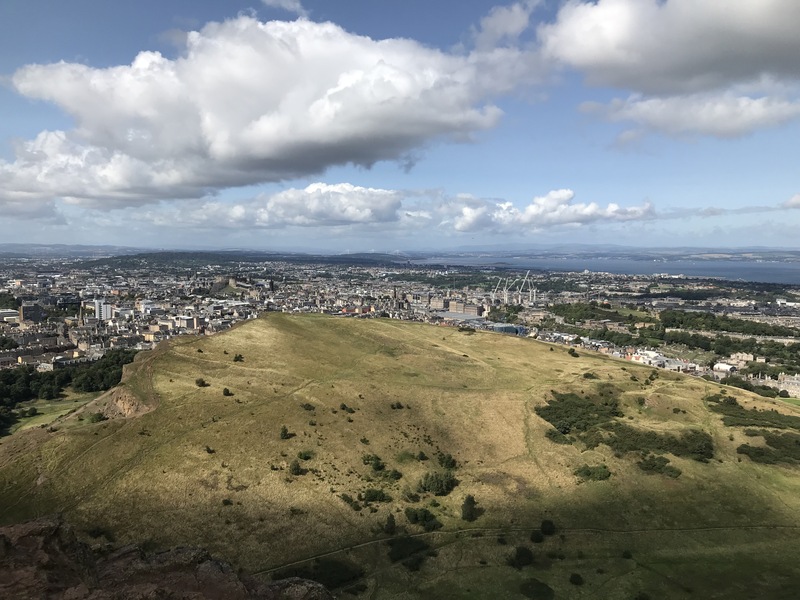 If you’re lucky enough to be in Edinburgh on a clear day, scratch your other plans and climb Arthur’s seat. Climb it to the top! This isn’t a race, take your time. Don’t forget your tiny bottle of Scotch for when you reach the top. Don’t do anything foolish and maybe check the wind advisories before you go. Haggis is fine if you like meatloaf. They don’t make it in a sheep’s stomach anymore because, hello, this is a nation that has a National Healthcare Service. Haggis isn’t that scary and it’s also not that great, but give it a try! If you really want to expand your palate, try some of Edinburgh’s renowned international cuisine. Thanks to the long arm of colonialism, the United Kingdom has some of the best Middle Eastern and Asian food in the world. My favorite restaurant in Edinburgh was Lancers, an Indian restaurant that’s been serving incredible food since the eighties and just underwent a complete remodel of the restaurant and menu. Compared to the potato heavy Scottish meals, Lancers was bursting with flavor, colors, and enticing aromas. From high-tea at fancy restaurants to underground cave bars, Edinburgh welcomes all kinds. You’re a tourist in a unique city so don’t feel ashamed to buy as many plaid cashmere scarfs as you want! Visit the castle, wear tartan, eat haggis. Let yourself get lost among the closes and wander into serene open parks. In every part of Edinburgh, there’s something just a little bit magical.